This past weekend we had a small wedding order consisting of the bridal bouquet and a few extras like boutonnieres﻿, corsages, and a hair garland. 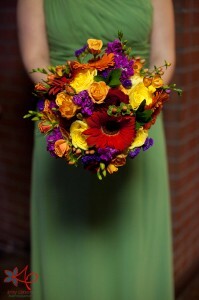 I really enjoy bouquets designed in this clustered style. Rather than homogenously mixing the different flowers and colors, similar bloom are grouped together in the design. It allows your eye to pay more attention to each type of flower and provides a different texture than a bouquet designed in a potpourri style. ﻿﻿﻿﻿﻿﻿My favorite name for this kind of design is “constellated” – it sound more elegant than “grouped” or “clustered”. 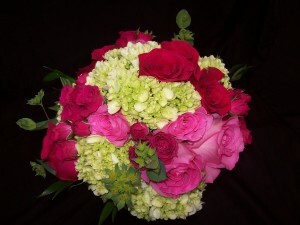 This constellated bouquet is comprised of green mini hydrangea, hot pink spray roses, and two shades of pink roses accented with buplurum. It would be nice to say that as a designer you love every arrangement the same, but there are always those ones that take root in your mind’s eye and you can’t seem to forget. This bridal bouquet is like that for me. It might be the bold and vibrant colors- warm accented with vivacious cools. 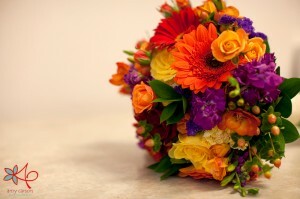 It might be the way the bouquet fit the personality of the friendly and kind bride. It might be that I was able to use some of my personal favs orange freesia, Francesca stock, peach hypericum, and orange spray roses. All that just to say this bouquet still gives me that giddy feeling that I have when I finish a bridal bouquet! I want to give a big thank you to Amy Carson Photography for sharing these beautiful images! 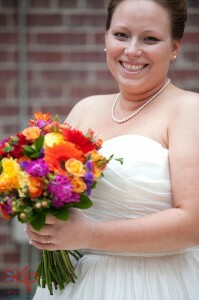 She did a wonderful job at capturing the essence of the bouquets. 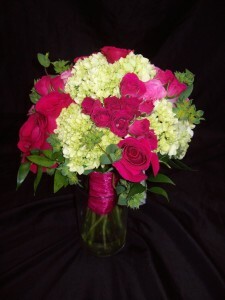 And thank you to the beautiful, sweet bride Sarah for choosing Blossom Basket to be your florist!